It is observed that there is a static charge on the products during the conveying of the products carried in the conveyors or during the conveyor lining operations. 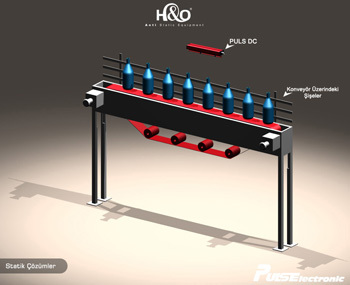 The process of conveying the plastic bottles on the conveyor line is shown. Static charge is an unwanted condition as bottles will dust on the conveyor and cause faulty production. In order to solve the problems, when the H & O Air Reinforced Anti Static Rods are installed as shown in the figure, the outer surfaces of the bottles will be neutralized and problems will be avoided.